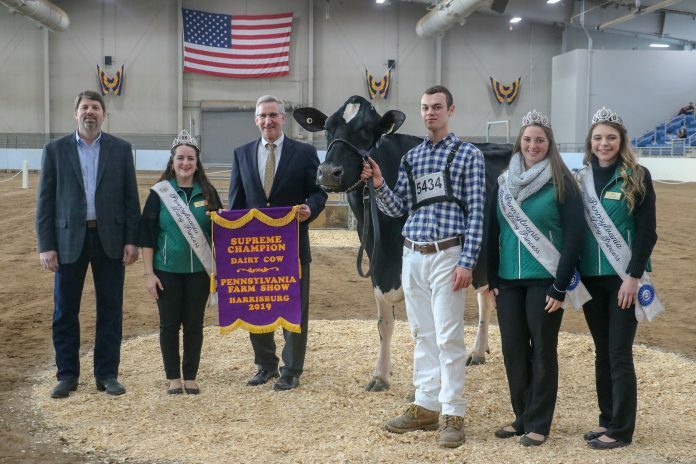 HARRISBURG, Pa. — The grand champion Holstein, the first-place aged cow owned by Jill Dice and Galen Martin of Fredericksburg, Lebanon County, won supreme champion honors at the 2019 Pennsylvania Farm Show in Harrisburg. She also won supreme champion honors at the 2015 Pennsylvania Farm Show. Seven breeds put forth their grand champions to compete for the supreme champion title in the open dairy show. Judges were Kevin Michalovich from Nashville, Ohio; Dwight Stoltzfus, Somerset County; and Paul Moyer, Lycoming County. Holstein. Grand champion: Gajan Carla, Jill Dice and Galen Martin of Lebanon Co., and exhibited by Ben Rhodes; reserve champion: D-V-C Atwood Dymond, owned by Delaware Valley University, Bucks Co.
Ayrshire. Grand champion: Marbrae Modem Jasmine, an aged cow exhibited by Roy Coale of Hidden Valley Ayrshires, Cumberland Co; reserve champion: Mowry’s Ryder Gollee, owned by Shultz Cattle Company, York Co.
Red and White. Grand champion: Claytoncrest Spicy-Red-ET, a 2-year-old owned by Lynette Gelsinger of Berks Co.; reserve champion: JJK-Shultz Dtntr Lizy-Red, exhibited by Ethan Sterner of Berks Co.
Guernsey. Grand champion: Knapps Ladysman Tigger– ETV, a 2018 spring yearling exhibited by Kelly Johnson of Lancaster Co., and owned by Rutters Dairy. reserve champion: Knapps Copper Tropical, exhibited by Kelly Johnson. Milking Shorthorn. Grand champion: BJ Colors Stanley Nevaeh, a 3-year-old exhibited by Brian Nailor of Cumberland Co.; reserve champion: BJ Colors Stnly Raspberry EXP exhibited by Joleigh Nailor, Cumberland Co.
Brown Swiss. Grand champion: Heilinger Java Wiggles, a 5-year-old exhibited by Katie Wright of Acme, Fayette Co; reserve champion: Northkill Creek Glammer, exhibited by Hannah Balthaser of Berks Co.
Jersey. Grand champion: EDN-RU Juno Idelles Iris, 4-year-old owned by Edn-Ru Jerseys of Centre Co; reserve champion: EDN-RU Tequila Margie Matilda, Edn-Ru Jerseys. Division I (born between 1999-2001): Lily Stenning, Bedford Co.
Division II (born between 2002-2003): Olivia Lesher, Berks Co.
Division III (born between 2004-2006): Ian Walker of Acme, Fayette Co.
Division IV (born between 2007-2009): Hailey Blatt, Berks Co.